Greek Revival was a style of architecture popular from about 1800-1855. The most defining element in its vernacular form is a roof with a pitch similar to that seen in classic Greek temples. I've always liked the style. I started thinking about the style in earnest when we were still looking at farms, out at the western edges of Ashtabula and Trumbull counties, before we decided to buy a house in an inner-ring suburb. Out there, plenty of these houses are still standing. 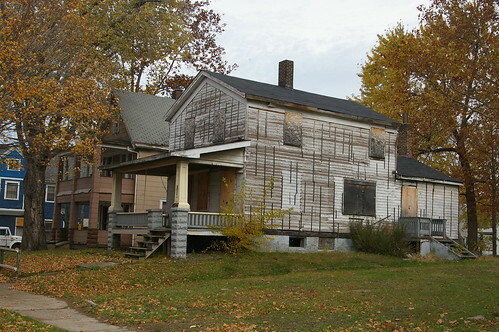 It started me thinking about the possibility of the existence of such houses in the city of Cleveland. I knew they existed in the suburbs - I'd lusted over this 1853 farmhouse on Fairmount Boulevard, in Shaker Heights. While many of the older houses in the city have succumed to decay or redevelopment, some still must be standing, I assumed. This started me on a quest to find as many Greek Revival houses in the city of Cleveland as I could. My focus was on the east side, due primarily to the location of my house and job. I began by just driving up and down the streets, a photocopy of a local street atlas in hand, crossing off streets as I checked them. 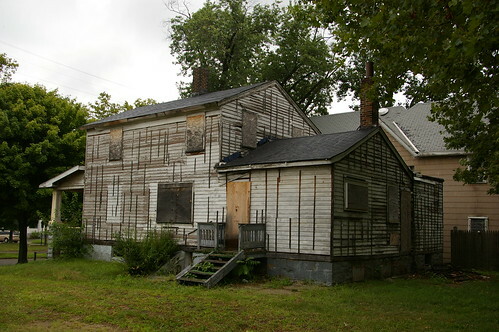 This house, on E. 130th St., just north of Kinsman, was the first that I found. It encouraged me to look further. In my quest so far, this house is the best one I've found that isn't currently being used as a residence. 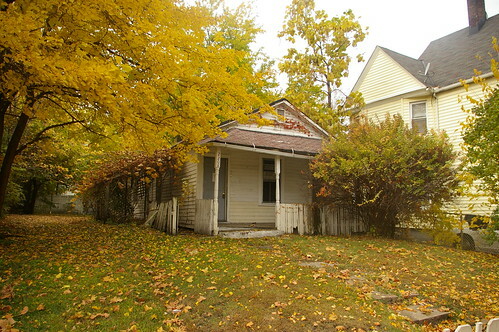 It is located at 1209 East 71st Street, just north of Superior. I assume that it could probably be available for sale at a reasonable price. 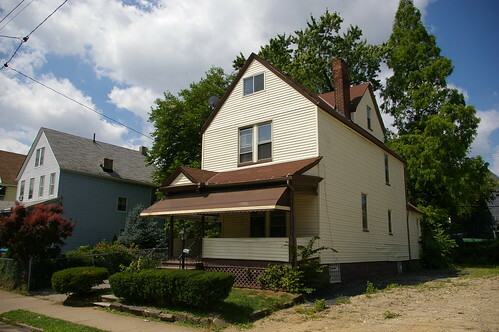 The current owner, Great Lakes Home Remodelers, purchased it on July 13, 2006 for $4800. They do not appear to have done any work to it since then. They also have not paid taxes on the property since then - the back taxes amount to about $2700. They own four other properties in the city, all foreclosures, all purchased under similar conditions. They don't appear to have ever paid taxes on any of them. The house needs work - I'll be the first to admit that. It's not too far gone, though - it can be saved, probably without an insane amount of money. The lines are really clean and the proportions are just right - imagine how great it would look without the front porch. The people who removed the aluminum siding have allowed us to see the original locations of the windows on the first floor. My hope is that the windows on the second floor are original - they appear to be in the original locations. This is what the tooling on the foundation looks like on the main part of the house. 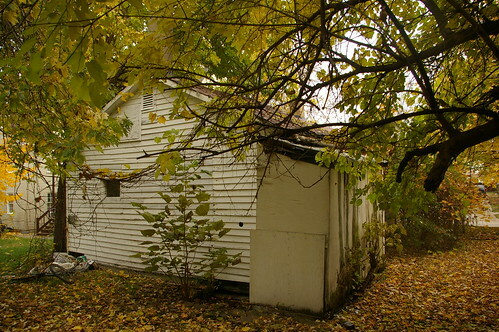 I had assumed that the flat-roofed addition was built considerably later, and was a probable candidate for demolition for the purchaser of the house. When I looked at it yesterday, I saw that the foundation for the addition was also made out of sandstone and had similar toolmarks to the foundation on the main part of the house. Now I'm inclined to keep it and research the original design - I find it hard to believe that a structure with a flat roof could have lasted so long. The lot behind the house and the one next to that, as well as the lot to the south of the house are all city owned. 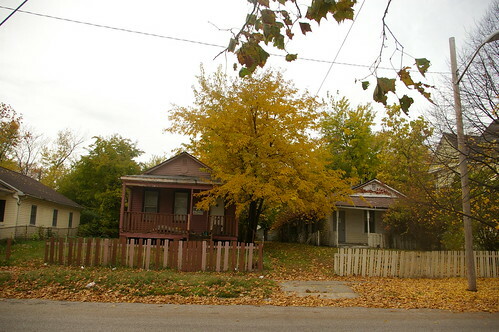 The city is presently selling lots adjacent to homeowner's property for $26, including transfer fees. The three lots total 19,200 square feet - added to the 5500 square foot lot, this would give you slightly more than half an acre - plenty of space for gardening, a nice sized garage, or whatever other needs you might have. The house itself is 1500 square feet. The tax mailing address for Great Lakes Home Remodelers, a company incorporated by Gregory Green in 2001, is 1418 E. 65th St., Cleveland, OH 44103. This appears to be Mr. Green's residence. In addition to the five properties described above, he owns another former forclosure under his own name. I do not know what Mr. Green's intentions for these properties are. I would assume, however, given his financial situation, that he would be more than willing to sell this one. 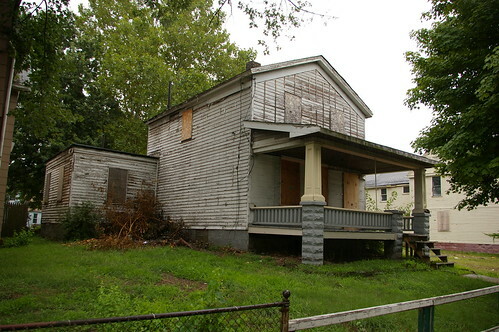 This is the best opportunity I've yet seen to find a Greek Revival house in the city. Providing that the inside isn't totally trashed, this represents a very worthwhile project. This house needs to be saved. I'd buy it myself if it was closer to my job or my house. Imagine this house and the adjacent property a couple of years down the road. 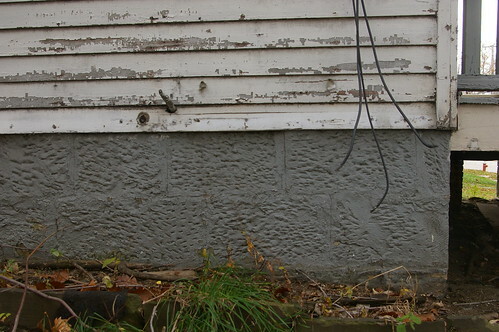 You've removed the porch, replaced the rotten boards, and painted the house white. A picket fence encloses your yard and the surrounding lots, which you purchased from the city. On one of those lots sits a garage, painted red, reminiscent in shape of the sort of barn you'd find near a farmhouse like this. I really believe in this house. If you buy it, I'll gladly throw whatever labor I can into the project. We need to act now. Without futher action, this house will probably be gone in a few years.